I started writing a longer post this morning, and I haven’t finished it yet. I figured seeing the extended cut of Metropolis was more important. When I do ultimately finish today’s real post, I’ll retroactively post it. Or something. As I expected, the accelerometer inside the iPhone is probably not sensitive enough to accurately track anyone’s sleep patterns. But still, it’s fun to think about. 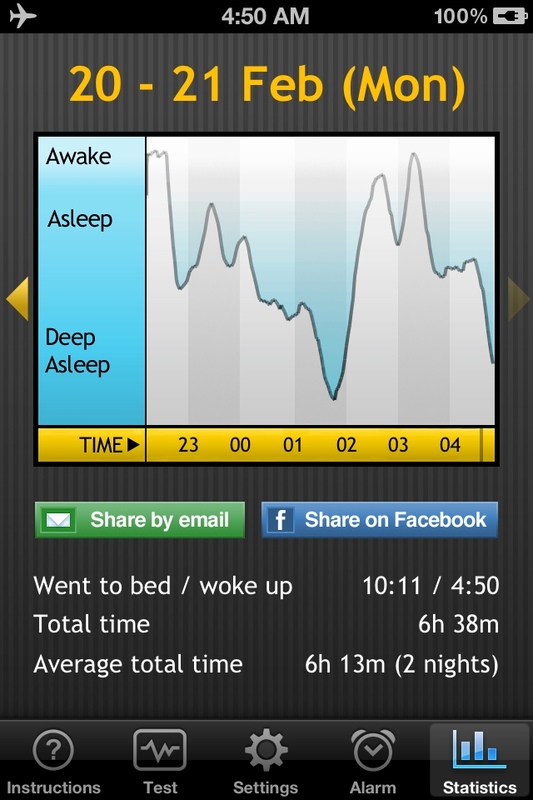 Interestingly, the app I had been using to track my sleep before this weekend was made by my friend Tom’s major competitor. The one that he suspects is sabotaging his rating and rankings in the App store. Whoops. I don’t really feel that guilty. After all, I wouldn’t have the app if he hadn’t have told me to download it in the first place. Hell, I wouldn’t even know such an app exists. Anyway, I’m loyal enough to stop using the old app, and I asked Tom which app to try instead. He suggested this one: Sleep Cycle. Now, is this app any better than the other one, which I wont name? Probably not. Does either app truly do anything? Possibly not. But what the hell, I need to wake up. Anyway, here’s my chart for last night. I suspect I’ll only be using this app as long as it takes Tom to make his own sleep app, which is next on his plate. Speaking of Tom and his apps, Fitness Buddy was featured on Gizmodo this weekend. Since I was responsible for most of the photography and video in that app, I feel like it’s worth plugging here. I do find it ironic that I worked so hard making content for a fitness app–the Gizmodo headline is ‘Stop Being Fat and Get In Shape with Your Smartphone’–and yet I’m very much out of shape, and not even interested in using that app. Maybe I should change that…BUT NOT TODAY. So, the Ghost Rider: Spirit of Vengeance review posted yesterday. I also saw The Secret World Of Arrietty (not to be confused with The Borrower Arrietty, or Arrietty, or The Borrowers) last Friday. I specify the version I saw was the Disney produced American localization, as opposed to the original Japanese or the UK/Australian version. I think it would be interesting to see all three, and maybe someday I will. But for now, I’ve only seen one. Sometime this week, I hope to review it. In short, though, it is a wonderful example of artistry. Even with the American voices, it’s worth seeing on as large a screen as you can. If you have the opportunity, go check it out. The other thing that is imminent is a new Radio EdSoft Film. Or two. We’ll see. Just gotta finish recording/mixing in the back announces.